New England head coach is Bill Belichick under intense scrutiny this week after his Patriots were reportedly guilty of under-inflating 11 of 12 football in the win over Indianapolis Sunday. Whether he and his team are actually punished for deflategate and how severe the sanctions are remains to be seen. What we do know is that this isn’t the first time the three-time Super Bowl winner has been accused of cheating. Of course, there was spygate in 2007 when former Patriots assistant coach Eric Mangini, who had left New England to coach the Jets, ratted on his former boss for stealing signals with a camera, after a Jets-Patriots game. 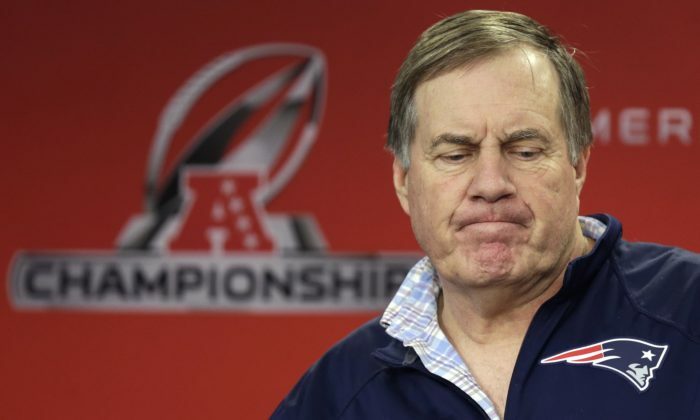 The cost of the scandal was steep for New England as the team was stripped of a first round pick while Belichick was fined $500,000 and the Patriots themselves paid $250,000. Belichick’s latest controversy before deflategate happened the previous week when, on multiple occasions, he lined up four offensive lineman and declared one receiver ineligible, which is an unusual, but legal formation. But according to Michael Rosenberg of SI, the normal protocol is for coaches to run these trick plays by the league office in the week leading up to the game. Belichick didn’t do that, though. He waited right up until the game was about to start to tell referee Bill Vinovich that he would declare certain players ineligible, putting Vinovich in tough spot to decide quickly whether it was legal. It was, but the deception was how he implemented it in the game, running his hurry-up offense on those plays, giving the Ravens no time to figure out who was eligible and who wasn’t. Normally when the offense makes a substitution, the defense is allowed to substitute and they can’t run the hurry-up. But against the Ravens the Patriots switched who was eligible and ineligible against the hurry-up, while the Ravens had not time to adjust. Possibly with a few days notice, the NFL could have seen what Belichick would be up to and snuffed it out. They didn’t and the three trick plays netted them 41 yards, which was huge in the tight game. Last season, Browns coach Mike Pettine suggested Belichick got a copy of the Jets playbook from through Alabama coach Nick Saban, though Saban and former Jets coach Rex Ryan denied it. Incidentally the Jets are just 10–21 against Belichick, while in New England. Belichick has also been suspected to sign players with the purpose of gaining intel on opponents, like when he signed safety Don Jones a day after the Miami Dolphins cut him and six days before they were to play the Dolphins in the 2014 opener. Deflategate is just the latest for Belichick. MORE: Did the Seahawks use an illegal onside kick formation against the Packers?